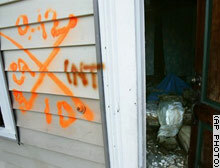 Hurricane Katrina stopped killing people Oct. 1. That's the date state health officials have assigned as the cutoff for an official Katrina-related death for people who evacuated the New Orleans area because of the Aug. 29 hurricane and died in another city. It is just one of many guesstimates in the state's hurricane death count, a number characterized by unknown and under-researched data, a high level of secrecy and a lack of communication between parish coroners, state health authorities and the public. The confirmed death toll as of October 14 stands at 1,277, mainly from Louisiana (1,035) and Mississippi (224). Direct deaths indicate those caused by the direct effects of the winds, flooding, storm surge or oceanic effects of Katrina. Indirect deaths indicate those caused by hurricane-related accidents (including car accidents), fires or other incidents, as well as clean-up incidents and health issues. St. Charles 8 [link] ? Note: Because of differences in the timing of reports from different sources, states' State sub-totals may not match their individual county State sub-totals. BATON ROUGE, La., Oct. 4 - In a country that cherishes the names of the dead, reads them aloud, engraves them in stone and stitches them into quilts, it is odd that Hurricane Katrina's victims remain, more than a month later, largely anonymous. With 972 deaths confirmed and the search for bodies declared complete, the state has released only 61 bodies and made the names of only 32 victims public. In contrast, of the 221 dead in Mississippi, 196 have been identified, a state official said. State officials, still in crisis mode, say compiling and releasing data about the dead is simply not a priority. On the edges of the disaster zone, a much clearer picture of Hurricane Katrina's victims has emerged. In Houston, the Harris County Medical Examiner's Office lists the names of 53 evacuees who have died, most of natural causes and two by suicide. Six were under 21; the oldest victim was 95. Families of the victims have expressed frustration that the process is not moving more quickly. One woman, Marion K. Babin, said it took weeks to get the body of her husband, Justin Babin, though he wore a hospital bracelet and medical dog tags listing his name and condition. Just as in Louisiana, Mississippi's bodies were too decomposed to be viewed by families - but many could be identified by physical characteristics. In Jackson County, 9 of 12 identities were confirmed, mostly by scars, tattoos, prosthetics or implants, said Vicki Broadus, the coroner. The health department has collected 246 DNA samples from relatives. One morgue worker has been traveling to New Orleans to salvage dental records. Louisiana officials believe they can identify about half of the 783 bodies brought so far to the St. Gabriel morgue. A corpse lies inside a home in New Orleans Tuesday. The markings indicate it was found two weeks ago. But four weeks after Hurricane Katrina, they have released the remains of just 32 people to family members, the state's chief medical examiner said Wednesday. Dr. Louis Cataldie, Louisiana's emergency response medical director, told reporters in Baton Rouge the process is delayed because autopsies must be conducted on people found in nursing homes and hospitals. The autopsies were ordered under the state attorney general's investigation into whether patients were abandoned as the hurricane came ashore and the water rose on August 29 and 30. St. Charles 5 [link] ? <> Note: Because of differences in the timing of reports from different sources, states' State sub-totals may not match their individual county State sub-totals. Note 1: Includes county and parish.